Consolidate your admit and alert wristbands using In-A-Snap® alert clasps! 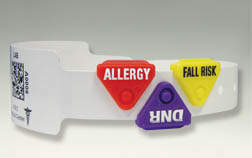 Communicate multiple color code alerts on a single consolidated wristband easily and effectively with the unique interleaving design of In-A-Snap® color code alert clasps. They work a wide variety of PDC Healthcare's snap-closure patient identification wristbands.